The Gram-positive bacterium Streptococcus suis serotype 2 is an important swine pathogen and emerging zoonotic agent. Multilocus sequence typing allowed dividing S. suis serotype 2 into sequence types (STs). The three major STs of S. suis serotype 2 from North America are 1 (most virulent), 25 (intermediate virulence) and 28 (less virulent). Although the presence of DNase activity in S. suis has been previously reported, little data is available. The aim of this study was to investigate DNase activity in S. suis according to STs, to characterize the activity and gene, and to provide evidence for a potential role in virulence. We showed that ST1 and ST28 strains exhibited DNase activity that was absent in ST25 strains. The lack of activity in ST25 isolates was associated with a 14-bp deletion resulting in a shifted reading frame and a premature stop codon. The DNase of S. suis P1/7 (ST1) was cell-associated and active on linear DNA. A DNase-deficient mutant of S. suis P1/7 was found to be less virulent in an amoeba model. Stimulation of macrophages with the DNase mutant showed a decreased secretion of pro-inflammatory cytokines and matrix metalloproteinase-9 compared to the parental strain. This study further expands our knowledge of S. suis DNase and its potential role in virulence. Streptococcus suis is an important swine pathogen worldwide that causes mainly meningitis, arthritis, endocarditis, and septicemia . It can also affect humans in close contact with infected pigs or contaminated pork-derived products [2, 3]. More particularly, two major S. suis outbreaks with symptoms of toxic shock-like syndrome occurred in 1998 and 2005 in China and caused over 50 deaths . To date, thirty-five serotypes have been described and serotype 2 is the most commonly isolated from diseased pigs and humans . In addition, S. suis is classified into numerous sequence types (STs) by multilocus sequence typing (MLST) . A recent study showed that most isolates of S. suis serotype 2 from North America are part of three major STs: ST1, ST25 and ST28 showing high, intermediate and low virulence in a mouse model, respectively . Despite several virulence factors already identified, the pathogenesis of S. suis infections is not fully understood, especially regarding the mechanisms that allow the bacterium to escape from the host immune system . The best characterized factor providing resistance of S. suis to the host immune system is the sialic acid-rich capsule . More specifically, the capsule confers resistance to phagocytosis by macrophages, and mutants deficient for capsule expression are less virulent in mouse and pig models of infection [9, 10]. Moreover, unencapsulated mutants are also more sensitive to antibiotics, including penicillin G and ampicillin . Evidence has been brought to support a role of bacterial deoxyribonucleases (DNases), which are enzymes that hydrolyze nucleic acids to yield oligonucleotides, as virulence factors. More specifically, DNases may be involved in bacterial growth  and biofilm maturation , as well as in the ability of bacteria to escape the immune system . In 2004, a cell-associated DNase (112 kDa), encoded by the ssnA gene, has been identified in S. suis serotype 2 . The recent pan-surfome analysis performed on S. suis and which concluded that the cell-associated DNase may represent one of the best vaccine candidates has revived the interest for this protein . More specifically, it was found that the S. suis DNase is largely distributed among serotypes, and is highly immunogenic and accessible to antibodies . In addition, de Buhr et al. recently reported that S. suis DNase is involved in the degradation and escaping of neutrophil extracellular traps. The aim of the present study was to investigate the distribution of DNase activity among the three major STs (ST1, ST25, and ST28) of S. suis, to characterize the activity and gene, and to provide evidence for a potential role in the pathogenic process of S. suis infections. Strains of S. suis used in this study and their origin are listed in Table 1. Bacteria were routinely grown in Todd-Hewitt Broth (THB) (BBL Microbiology Systems, Cokeysville, MD, USA) at 37°C. 1Determined with the DNase Test Agar medium. (+), presence of a clear zone around bacterial growth; (-), absence of a clear zone. 2DNase-deficient mutant from S. suis P1/7. Strains of S. suis were screened for DNase activity using a plate assay. Briefly, 50 μl of overnight broth cultures of S. suis were spotted on the surface of DNase Test Agar plates (BBL Microbiology Systems) which were incubated for 24 h at 37°C. After adding 0.1 N HCl for 5 min, the appearance of a clear zone around bacterial growth indicated degradation of DNA. DNase activity of S. suis P1/7 was also determined and characterized by quantification of residual DNA after incubation of bacterial cells or filtered culture supernatants with DNA using the Quant-iT™ PicoGreen® dsDNA Reagent (Invitrogen, Eugene, OR, USA) according to the manufacturer’s protocol, as previously described , with some modifications. Briefly, linear double-stranded salmon sperm DNA (Sigma-Aldrich Canada Co., Oakville, ON, Canada) was prepared in DNA buffer (5.96 g/l HEPES [N-2-hydroxyethylpiperazine-N’-2-ethanesulfonic acid], 590 mg/l CaCl2.2H2O, and 380 mg/l MgCl2, pH 7.5 prepared in RNase/DNase-free water) at 100 μg/ml, and incubated with cells of S. suis (OD660 = 1 in DNA buffer) or filtered culture supernatants. To determine heat stability of DNase activity, cells of S. suis were preheated for 30 min at 50, 60 or 70°C prior to adding double-stranded salmon sperm DNA in the assay. A range of pH between 6 and 8 with increment of 0.5 was used to determine the optimal pH for DNase activity. Ion chelators (ethylenediaminetetraacetic acid [EDTA], ethylene glycol tetraacetic acid [EGTA] and 1,10-phenanthroline) were tested for inhibition of S. suis DNase activity at 1 and 10 mM. Following incubation (3 h) at 37°C (or 25, 30 and 42°C for optimal temperature determination), samples were centrifuged 5 min at 11,000 g and residual DNA was quantified by adding the PicoGreen® reagent. After 5 min at room temperature, fluorescence was measured with a Synergy 2 BioTek microplate reader (BioTek Instruments, Inc, Winooski, VT, USA) using excitation wavelength of 485 nm and an emission wavelength of 528 nm. S. suis P1/7 cells from an overnight culture were harvested by centrifugation and suspended in 10 mM Tris–HCl buffer (pH 7.5) containing 5 mM CaCl2 and 4 mM MgCl2 to an OD660 = 1. Cells were incubated with 40 ng/μl (final concentration) linear DNA (lambda DNA [Promega, Madison, WI, USA]) or 32.5 ng/μl (final concentration) circular plasmid DNA (pUC18) for 3 h at 37°C and degradation was monitored following migration in a 0.8% agarose gel (45 min, 110 V) and staining with EZ-Vision™ Three (Amresco, Solon, OH, USA). Three strains of S. suis belonging to ST1 (P1/7, MNCM01, MGGUS2), ST25 (1043248, MNCM04, MGGUS4) and ST28 (1097205, MNCM43, MGGUS9) were grown for 24 h on THB agar plates. Colonies were suspended in sterile water, boiled for 10 min and centrifuged at 10,000 g for 3 min. PCR was then performed using the following primers in a reaction mixture containing 5 U EconoTaq® (Lucigen, Middleton, WI) and 1.5 mM MgCl2: ssnA 3088 F (5′ GAC GTC CAT ATA TAA CAA AAA GGA G 3′) and ssnA 5392R (5′ GTC GAT TCG GCC TAG GCT GAG ATT G 3′) or ssnA 3884 F (5′ ATT ACA GAA ACA AAC ATC GCT CAG T 3′) and ssnA 6278R (5′ ACA AGT GGA GGT GGA GCA GTA GAA A 3′). Thirty PCR cycles were performed starting with 1 min denaturation at 94°C, 1 min hybridization at 56°C and 3 min elongation at 72°C. Products were sequenced and compared to the ssnA sequence of S. suis P1/7 (ST1) using BioEdit and the NCBI database. BLASTp was used to compare the predicted amino acid sequence of the DNase with that of similar proteins identified in other streptococcal species. A mutant library constructed in a previous study  by using the pTV408 temperature sensitive suicide vector to deliver the Tn917 transposon into S. suis P1/7 via electroporation was screened with the DNase plate assay to recover a deficient mutant. The number of transposon Tn917 insertion in the DNase deficient mutant (M2D) was determined by southern blot using a digoxygenin (DIG)-labeled probe specific to the erm gene of transposon Tn917 as previously described . The exact site of insertion of transposon Tn917 in mutant M2D was determined using plasmid rescue. Briefly, genomic DNA was extracted and digested using HindIII, ligated and PCR was then performed on the ligature mix using the primers Erm-F (5′ ACG AGT GAA AAA GTA CTC AAC C 3′) and Tn917 (5′ AGA GAG ATG TCA CCG TCA AGT 3′), 5 U EconoTaq® (Lucigen) in 1.5 mM MgCl2. Thirty PCR cycles were performed starting with 1 min denaturation at 94°C followed by 1 min hybridization at 50°C and 5 min elongation at 72°C. Amplicons were then sequenced (Genomic Analysis Platform of Université Laval, Québec, QC, Canada). The DNase-deficient mutant (M2D) and its parental strain (P1/7) were tested using the amoeba host model Dictyostelium discoideum. In a previous study , we showed that D. discoideum cannot multiply and form plaques on lawns of virulent strains of S. suis, including P1/7, whereas plaque formation was observed on lawns of mutants (capsule, subtilisin-like protease) of S. suis known to be avirulent in an animal model. Briefly, amoebae were grown in HL5 liquid medium (14.3 g/l peptone, 7.15 g/l yeast extract, 18 g/l maltose, 3.6 mM Na2HPO4, 3.6 mM KH2PO4) containing tetracycline (15 μg/ml). Amoebae were harvested by centrifugation (5 min at 1,500 g), washed, and resuspended in tetracycline-free HL5 medium at a concentration of 300, 150, 75, 38, 18, or 9 amoeba cells per 5 μl. Meanwhile, bacteria were harvested by scraping the surface of two Petri plates with confluent lawns of growth (overnight at 37°C) and suspended in 2 ml of HL5 medium without tetracycline. The bacterial suspensions (100 μl, OD660 ≈ 5) were then applied to wells of 24-well plates containing HL5 agar medium (2 ml/well). Once dried, bacterial lawns were spotted with 5 μl of the D. discoideum suspensions. Plates were incubated at 23°C for 2 days and then examined visually for plaque formation. Three independent experiments were performed to ensure reproducibility. The human monoblastic leukemia cell line U937 (ATCC CRL-1593.2; American Type Culture Collection, Manassas, VA, USA) was cultivated at 37°C in a 5% CO2 atmosphere in RPMI-1640 medium (HyClone Laboratories, Logan, UT, USA) supplemented with 10% heat-inactivated fetal bovine serum (FBS; RPMI-FBS) and 100 μg/ml penicillin-streptomycin. Differentiation into macrophage-like cells with phorbol 12-myristate 13-acetate was performed as previously described . One million macrophage-like cells were seeded in 12-wells culture plates and incubated overnight at 37°C in 5% CO2. Culture medium was then aspirated and replaced with fresh RPMI-1640 supplemented with 1% heat-inactivated FBS and 100 μg/ml penicillin-streptomycin containing S. suis (DNase-deficient mutant [M2D] or parental strain [P1/7]) at multiplicity of infection (MOI) of 100, 50 or 10. After 24 h of stimulation at 37°C in 5% CO2, supernatants were collected. Quantification of interleukin-6 (IL-6), interleukin-8 (CXCL8), tumor necrosis factor-α (TNF-α), and matrix metalloproteinase 9 (MMP-9) was performed by enzyme-linked immunosorbent assays (ELISA) (eBioscience Inc., San Diego, CA, USA) following the manufacturer’s instructions. All treatments were performed in triplicate. Differences between means were analyzed for statistical significance using the Student’s t-test and were considered significant at p < 0.05. Thirty-six S. suis serotype 2 strains were tested for DNase activity using the plate assay. All strains grew similarly on the DNase Test Agar medium. As reported in Table 1, strains belonging to ST1 and ST28 all possessed DNase activity whereas ST25 strains did not show any capacity to degrade DNA. A comparative analysis of the ssnA gene of S. suis strains belonging to either ST1, ST25 or ST28 was performed. Sequence comparison of the ssnA gene of S. suis P1/7 (ST1; SSU1760; UniProt accession no. C5VVJ6) with those amplified from S. suis serotype 2 belonging to each of the three STs showed that the nucleic acid sequence of ssnA gene of S. suis P1/7 is identical to that of corresponding genes found in S. suis isolates belonging to ST1 group. The ssnA gene from P1/7 showed a % identity of 98.1% and 98% with corresponding genes in strains of the ST25 and ST28 groups, respectively. However, when the predicted amino acid sequences were analyzed, the ST25 group (devoid of DNase activity) showed only 36.3% identity with the predicted protein of gene SSU1760 of S. suis P1/7 whereas ST28 and ST1 groups showed 98.4% and 100% identity, respectively. A detailed sequence analysis revealed that the low % identity in the predicted protein of S. suis ssnA gene of the ST25 group is related to a truncated form of the protein due to the loss of 14 bp region starting from position 1140 (Figure 1). A shifted reading frame is associated with this deletion, generating a stop codon starting at position 1170. Comparative analysis of the ssnA gene according to STs. Nucleic acid and predicted amino acid sequences of ssnA gene (from position 1108 to 1173) of S. suis belonging to ST1, ST25, and ST28 were compared in order to identify the origin of the loss of DNase activity in ST25. The ssnA gene is preceded by gshA (glutamate cysteine ligase/glutathione synthetase) and followed by hslO (Hsp33-like chaperonin). This genetic organization is conserved in all published genomes of S. suis (data not shown). The open reading frame (ORF) of S. suis P1/7 ssnA is 3120 bp in length and codes for a 1039 amino acid protein. The resulting SsnA protein possesses the Gram positive cell wall anchoring motif (LPKTG) at the C-terminus end followed by a hydrophobic domain, while a signal peptide is found at the N-terminus end. It also has two oligonucleotide/oligosaccharide-binding (OB)-fold domains. The active site belongs to the endonuclease/exonuclease/phosphatase family domain according to Kegg database (http://www.genome.jp/dbget-bin/www_bget?ssi:SSU1760). Comparison of the predicted amino acid sequence of DNase SsnA (SSU1760) with similar proteins found in other pathogenic streptococcal species showed that the protein shares 48.7% and 48.4% identity with SpnA and spyM18_0808, respectively, which are both cell-wall anchored DNases of Streptococcus pyogenes. The predicted nucleic acid-binding domain (ITE TNI AQL AT QAQATLV SL KN) identified by Fontaine et al. in the DNase contains several residues found in the S. pyogenes SpnA nucleic acid-binding domain (VKE AVI SEL ET TTPSTLV KL SH). The fluorogenic assay was used to determine the localization, stability and optimal conditions of DNase activity of S. suis P1/7 (Table 2). The activity was found to be cell-associated and not secreted in the culture supernatant. S. suis DNase activity was heat sensitive since less than 2% activity remained after treatment of bacteria at 50°C (30 min). The optimal pH for the activity ranged between pH 7 and 7.5. DNase activity was slightly stronger at a temperature of 42°C than 37°C. The activity was completely inhibited by EDTA (10 mM) and EGTA (10 and 1 mM) and partially inhibited by 1,10-phenanthroline. To determine the substrate specificity of S. suis DNase, linear DNA or circular plasmid DNA was incubated with bacterial cells prior to monitor degradation by electrophoresis. As shown in Figure 2, the band corresponding to linear DNA was degraded after incubation with S. suis P1/7 compared to the control without bacteria (compare lane 3 with lane 2). The migration profile of circular DNA alone (lane 5) showed 3 distinct bands, which correspond to nicked DNA (6 kb band), linear DNA (4 kb band) and supercoiled DNA (2.5 kb band) . Incubation of circular DNA with the bacteria (lane 6) caused the appearance of a new band at 2.6 kb compared to the control sample. This band could correspond to supercoiled DNA bound to the DNase . A decreased intensity of the two bands (4 kb and 6 kb) corresponding to the linear and nicked forms of the plasmid was observed. Electrophoretic analysis of DNA degradation by S. suis P1/7 cells. Lanes 1: DNA markers, 2: Control linear DNA (lambda DNA), 3: Linear DNA + S. suis P1/7, 4: Linear DNA + S. suis DNase deficient mutant (M2D), 5: Control plasmid DNA, 6: Plasmid DNA + S. suis P1/7, 7: Plasmid DNA + S. suis DNase deficient mutant (M2D). A bank of mutants (1,150) of S. suis P1/7 prepared in a previous study  by insertion of transposon Tn917 was screened using the DNase Test Agar medium, and one mutant (M2D) completely devoid of DNase activity was identified. The loss of DNase activity was also confirmed after incubation of linear DNA with the mutant M2D (Figure 2, lane 4). Southern blot analysis of genomic DNA was performed in order to determine the number of insertion in mutant M2D. A single band was identified supporting the presence of one insertion of transposon Tn917 (data not shown). Using a plasmid rescue procedure, the insertion causing the loss of DNase activity was found to be in position 762 in ssnA gene. The virulence assay using the amoeba model D. discoideum was used to compare S. suis P1/7 with its DNase-deficient mutant M2D. As reported in Table 3, ≥ 300 amoebae per well were needed to cause plaque formation on bacterial lawns of the parental strain. However, amoebae in the range of 9 to 18 cells per well were sufficient to induce plaque formation on lawns of the DNase-deficient mutant, thus indicating a much higher susceptibility to predation by D. discoideum. The impact of the loss of DNase activity in the inflammatory response of S. suis cells in a macrophage model was investigated. Both S. suis P1/7 and its DNase-deficient mutant M2D induced IL-6, CXCL8, TNF-α and MMP-9 secretion by macrophages in a dose-dependent fashion (Figure 3). However, macrophages stimulated with cells of mutant M2D secreted significantly lower amounts of cytokines and MMP-9 in comparison with the parental strain. More specifically, at MOI of 100, the cells stimulated with mutant M2D produced 65.2%, 31.6%, 44.7% and 19.8% less IL-6, CXCL8, TNF-α and MMP-9 respectively, than the parental strain P1/7. Quantification of pro-inflammatory cytokines and MMP-9 produced by macrophages stimulated with S. suis P1/7 and M2D. 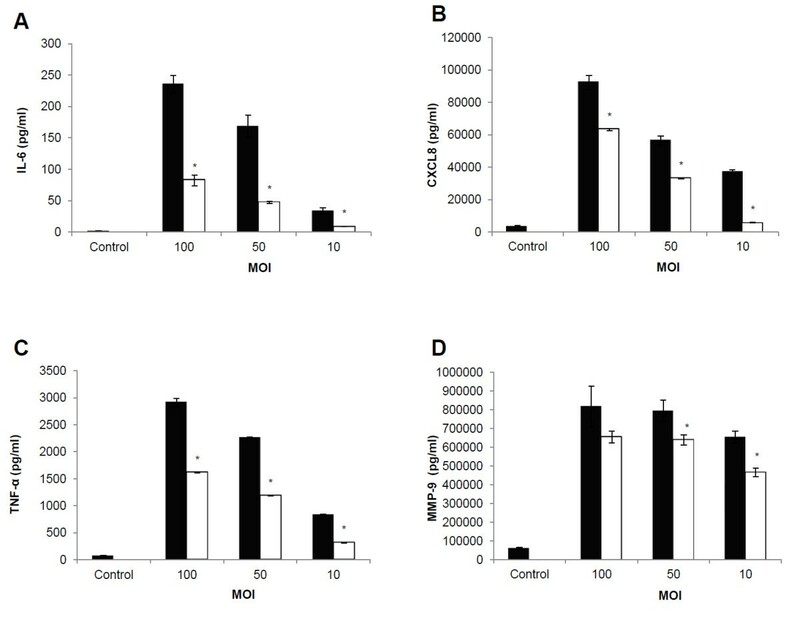 Secretion of IL-6 (panel A), CXCL8 (panel B), TNF-α (panel C) and MMP-9 (panel D) by macrophages stimulated with cells of S. suis P1/7 and its DNase-deficient mutant M2D at MOIs of 10, 50, and 100. *: p < 0.05. ■ S. suis P1/7, □ S. suis M2D. S. suis serotype 2 is responsible for important economical losses in the swine industry worldwide. In order to better understand the pathogenic process of S. suis infections, it is essential to identify all virulence factors produced by this pathogen and to evaluate their exact contribution in pathogenesis. In a previous study, Fontaine et al. identified a cell wall-anchored DNase in S. suis. Given that DNases have been suggested as an important virulence factor in human pathogenic streptococci [24, 25] and that very few is known on the DNase of S. suis, this study is of relevance. We first investigated the presence of this activity in the three major North American STs, namely ST1, ST25 and ST28 that differ in their virulence in a mouse model . This comparative analysis suggests that a direct link between virulence in mice and the presence of DNase activity cannot be established. While strains belonging to the most virulent ST (ST1) and to the less virulent ST (ST28) were all positive for DNase activity, ST25 strains having an intermediate virulence lacked the activity. The absence of DNase activity in ST25 strains is explained by a 14-bp deletion from position 1140 to 1153 in ssnA gene of these strains causing a shifted reading frame that generates a stop codon starting at position 1170. Considering that the insertion of a single transposon in mutant M2D resulted in a complete loss of DNase activity, it can be suggested that the DNase encoded by the ssnA gene is the only active extracellular DNase expressed by S. suis in the tested conditions. Interestingly, twenty-five genes coding for putative nucleases, including fourteen DNases are present in S. suis P1/7 genome (data not shown). Ones should not exclude that additional DNases strictly located in the cytoplasm and contributing to DNA catabolism and/or reparation can be expressed in addition to other extracellular DNase(s) only under specific conditions. No data are available on the localization of these putative nucleases. The ability of S. suis DNase to degrade linear and not circular DNA, as stated previously , suggests that it has uniquely an exonuclease activity. 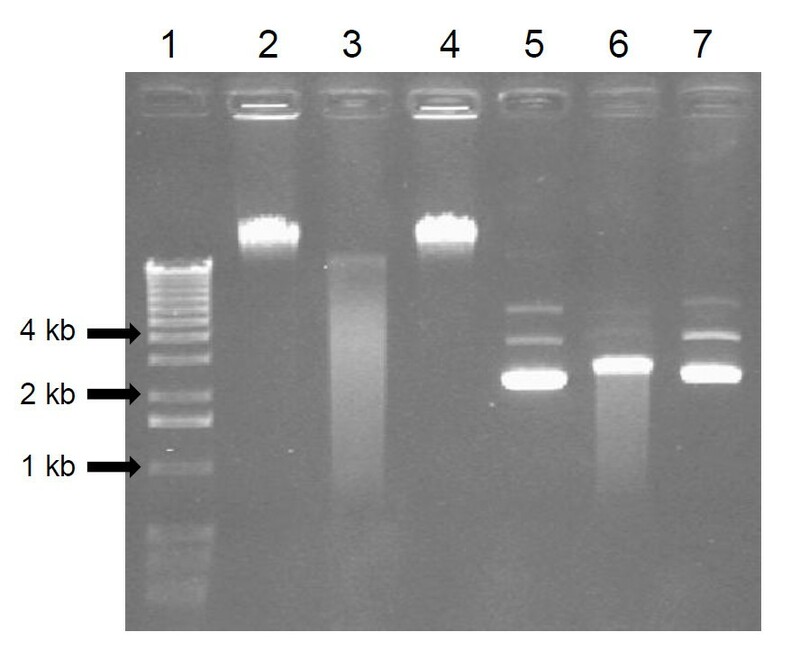 The fact that circular DNA treated with S. suis P1/7 showed a decreased intensity of the bands corresponding to the nicked and linear forms of the plasmid could be the result of its partial degradation. The remaining band migrated at 2.6 kb rather than 2.5 kb in the control sample could correspond to the binding of the DNase to supercoiled DNA . As opposed to the findings of Fontaine et al., we found that S. suis P1/7 DNase was heat-sensitive. This discrepancy may be related to the fact that we used a more sensitive assay procedure to determine DNase activity. S. suis DNase was active at physiological pH and temperature, with an increased activity at 42°C suggesting that, in case of infection, fever might promote DNase activity. Inhibition of the activity by ion chelators such as EDTA, EGTA or 1,10-phenanthroline is in agreement with the fact that the DNase activity of S. suis depends on the presence of Ca2+ and Mg2+. D. discoideum amoeba has been shown to be a suitable alternative host model to analyze the virulence of various pathogenic bacteria mainly due to its phagocytic activity and its easiness to use [26, 27], prior to use an animal model. In a previous study, we showed that S. suis mutants deficient for capsule expression or for the production of the subtilisin protease were sensitive to amoeba predation suggesting a decreased virulence as the one seen in an animal model . In this study, the DNase-deficient mutant was found to be more susceptible to amoeba predation compared to its parental strain. This suggests that DNase activity likely contributes to the virulence of S. suis, probably through an action on the phagocytic cells. Therefore, this decreased virulence should be confirmed in an animal model such as mouse or piglet. To determine a potential contribution of S. suis DNase in the host inflammatory response, macrophages were stimulated with the DNase-deficient mutant and its parental strain and cytokine and MMP-9 secretion was monitored. It was found that macrophages stimulated with S. suis P1/7 secreted higher amounts of IL-6, CXCL8, TNF-α, and MMP-9 than those stimulated with M2D. To the best of our knowledge, this is the first report on the ability of a bacterial DNase to exert a pro-inflammatory effect on macrophages. This contribution of S. suis DNase in cytokine and MMP-9 secretion may be of utmost importance in the pathogenic process of meningitis. Indeed, Lopes-Cortes et al. reported that TNF-α is present in the cerebrospinal fluid and that high levels of this cytokine correlate with neurological complications. Moreover, high concentrations of MMP-9 are observed in vivo in the cerebrospinal fluid during bacterial meningitis and in an experimental model of meningitis [29, 30]. These results in addition to the one from the amoeba virulence assay are evidences that the S. suis DNase activity directly affects phagocytic cells confronted to the bacterium. DNases have often been described as virulence factors in streptococci  or staphylococci . Indeed, it has been shown that DNase can help bacteria to escape from neutrophil extracellular traps (NETs) which are structures secreted by neutrophils to trap and kill bacteria . These structures are mainly made of DNA, proteases, anti-microbial peptides and histones . A recent study showed that S. suis DNase can degrade NETs to escape from the host innate immune system . In this study, we further characterized at the genetic and functional levels the S. suis cell wall-anchored DNase. We showed that this activity was present in all virulent strains belonging to ST1 and that less virulent isolates (ST25) lacked the activity. The absence of DNase activity was due to a conserved 14-bp deletion in the ssnA gene causing a shifted reading frame and apparition of an early stop codon resulting in a truncated and inactive protein. We showed that the DNase is active at physiological temperature and pH on linear DNA, and also brought evidences that it represents the most active DNase of S. suis since its inactivation completely abolished S. suis DNase activity. Furthermore, the DNase may contribute to the virulence of S. suis by increasing the inflammatory response. We wish to thank J. Slater (The Royal Veterinary College, Hatfield, United Kingdom) for providing the S. suis mutant bank. This study was funded by Discovery grants to DG, MG, and SJC from the Natural Sciences and Engineering Research Council of Canada (NSERC). SJC is a research scholar of the Fonds de recherche du Québec – Santé (FRQS). BH is recipient of a scholarship from the Swine and Poultry Infectious Disease Research Center (CRIPA). BH was the main experimentator for this study while LB carried out the screening of the S. suis P1/7 mutant library, isolated the DNase-deficient mutant and performed part of the virulence assays. KV was in charge of the molecular biology assays and analysis. SJC supervised the virulence assay. MG provided the S. suis strains. DG supervised and conceived this study. BH prepared the manuscript under the supervision of DG. All authors read and approved the manuscript.